Opels Lakeside Cabin 1 is a cozy one bedroom, one bathroom cottage on the lake. The cabin shares a beautiful cobblestone Lake Superior beach with the other Lakeside cabins. Enjoy watching the sunrise over Lake Superior from the cobblestone beach. The beach area is easy access down a flight of wooden stairs. 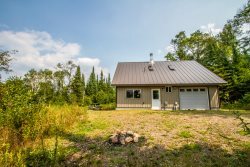 Located on Croftville Road near Grand Marais, this is a great summertime retreat. Perched just above the water, you can hear the waves crashing against the shoreline even with windows closed. The windows make the cabin bright and cheery while allowing you to enjoy the Lake Superior views from most rooms. The kitchen is small but ample for preparing meals during your stay. There is a small eating area for enjoying your homemade meals. The living room features a sleep sack sofa sleeper. Even more windows allow you to take in the Lake views. Enjoy watching TV on the flat screen while also watching Lake Superior and her many moods. The living room area also has a small electric stove for heat and ambiance. There is a full bed in the bedroom. The bedroom is separated by the rest of the cabin with curtains. The bathroom features a walk-in shower. Sit out on the deck and enjoy the views. Opels Cabin 1 has a private fire pit and charcoal BBQ. There is room for parking one car along the side of the cabin- sorry, no overflow parking At Opels Cabin 1 you are just steps from the beach. Opels Cabin 1 is the only cabin that is on the lakeside of Croftville Road. Beautiful sunsets are waiting for you. Croftville Road is a popular tourist destination where you can enjoy a retreat close to town but far enough away to feel secluded in your own little neighborhood. Rent one or rent all four cabins for a family retreat. You will enjoy the beauty surround Opels Cabin 1. The unique shoreline is enjoyable for all ages. Make Opels Cabin 1 your North Shore home away from home. Enjoy the clear blue waters of Lake Superior. Opels Cabin 1. Opels Cabin 1. Cabin 1's master lakeside bedroom has been updated with a living/bedroom feel which includes a flat-screen TV, Love Sack sleeper sofa, and a relaxing chair. Croftville Road, which is about 50 feet from the lake, intersects the resort. Cabin #1 is built between the road and the lakeshore and the other 3 are above the road, still only an average of 100 feet from the shore. The gal I spoke to when making final payment was super nice! This was a very nice location with an absolutely beautiful view! Not in town, but close enough to go wander around for the day! We watched the moon rise over the lake every night!! I thought my chat with the person (I think it was Cassie but not sure) who took my call about the light went well at the time. She was courteous, etc. Unfortunately somewhere along the way there was no evident follow-through. The location of the cabin couldn't have been better! We thoroughly enjoyed the really close proximity to Lake Superior and the easy access to it. The house was small but more than adequate for our needs since it was just the two of us. I appreciated the Wifi and put it to use. Great location. Small cabin. Everything worked. Opel 1 has the perfect location to enjoy the North Shore. It feels like you are ON the ocean. This was my first time there, and I hope to be back next year! Loved how close this cabin is to the water. Although it was a get away and a person should want to be "disconnected" while away, we wish that somehow, some way, the internet connectivity and speed could be improved for the few times we'd like to be "connected". The cabin is charming and the location (right on the lake) ideal. We're always impressed that you have all the modern things we may need (microwave, soft towels, etc.) yet the cabin retains its snug, "woodsy" feeling. The directions Cascade provides, both to the cabin and getting into the cabin, are clear and very helpful. The most perfect cabin for our first trip to the North Shore! The views of Lake Superior were incredible and we spent most of our time just relaxing on the stone beach, reading or skipping rocks. Our most favorite part of our stay was watching the stars and being able to see the Milky Way, just gorgeous. We will definitely be back again, and hope to be able to stay for longer. It was perfect! We loved everything about our stay at Cabin 1! The only suggestions we have are a new shower head and a little more attention to cobwebs. Otherwise, no complaints whatsoever and we will be returning! The cabin is charming with a great mixture of North Woods coziness and modern amenities. The location is ideal. We loved listening to the waves. The windows are placed so perfectly that we could see the lake from every room, including the bedroom. The heaters quickly heated the cabin in the evenings. The beds and furniture were comfortable. It was fun to meet the Opels, who stopped by to repair a door--very nice people. Opel 1 is small but very cozy. Had everything we needed. Loved the proximity to the lake. Planning to come back next year. Opels #1 was great and nice and clean. One suggestion would be to change to a darker blind color so it is a big darker at night/morning. This would help keep out the big light next door and the morning sun when needed. The kitchen and bath had everything we needed. It was perfect! Easy reservation process. Cabin was very clean. Very comfortable bed. Everything we needed was there. Friendly people at office. The location is fabulous. The home is nicely supplied. It was a good place to stay for a weekend, but the lack of a living room space would be problematic for us for a longer rental. A good experience.